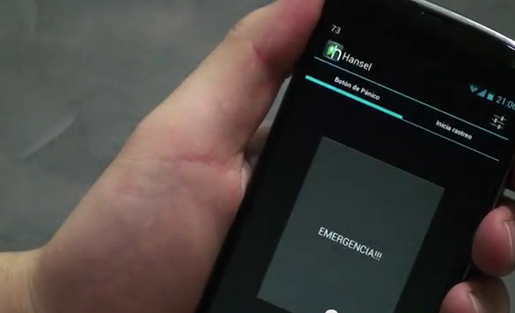 Hancel is an Android app that links journalists working in high-risk areas in Mexico to a preselected list of contacts and to NGOs dedicated to defending freedom of expression. Screenshot via Hancel video. Being a journalist in Mexico is dangerous. Reporters working in states most affected by drug-related violence have seen their beat change drastically since 2006, when former Mexican President Felipe Calderón launched an offensive against organized crime. For many journalists, local news now involves reporting on turf wars, missing people and mass graves. The type of news being covered is riskier, and having adequate security protocols has become all the more important. "The type of news being covered [in Mexico] is riskier, and having adequate security protocols has become all the more important." As attacks against journalists have increased, with five journalists confirmed as being killed in direct reprisal for their work in the last three years, reporters began thinking up ways of keeping themselves safer. A colleague, from a state in the north of Mexico, explained that every time a reporter leaves the office to cover a story it is common procedure to call a fellow journalist to let them know the route being taken as well as arrival and departure times. Journalists covering the crime beat in a state in the northeast of Mexico now move together to and from events. They say there is greater safety in numbers. Journalists traveling from Mexico City, which has largely been unaffected by the violence, to report on news in other areas of the country, also follow certain security procedures. Some reporters have a check-in system, calling designated contacts at certain hours of the day when out in the field, or they carry a GPS device, making it easier to locate them. But sometimes they travel alone, advising just one or two people. They think about the story, not about safety. Each assignment throws up questions about security. What do I do if there is a road block? Is the route I am taking safe? What is the best way to alert friends and colleagues without drawing attention to myself? In 2011, these were questions that I was asking myself while on reporting trips. I started thinking that there must be an easier and more efficient way to contact people when working in dangerous areas. When I met fellow journalist Diego Mendiburu, we realized the part technology could play. At the end of 2011, Mendiburu and I had the idea for Hancel, an Android app that links journalists working in high-risk areas to a preselected list of contacts and to NGOs dedicated to defending freedom of expression. The idea was simple, but building the app was not. We were two journalists with no contacts in technology, no idea of how to run a project, and even less an idea about funding. Two years on, Hancel is in beta phase and being piloted in both Mexico and Colombia. The project has the support of both local and international organizations, and in March last year received funding from the Knight Foundation. But there is still much work to be done. Hancel has taught us a lot about what it means to be a journalist trying to figure out the tech world. Over the coming months, I will be outlining the experiences that we have had while building Hancel, from where to find a programmer to explaining what a hack day is. We hope that by talking about this, we will encourage other journalists not only to start their own projects, but to also build long-lasting relationships with the tech community.